Dr.Leela D Souza is Mumbai based eminent homoeopath. She had her graduation from the University of Mumbai. Dr. Leela then pursued her special training from the British Institute of Homoeopathy. Her doctoral thesis was titled “Homoeopathy and Immunology”. She has authored many articles on various topics and interviewed many pioneer homoeopaths. It is a widely accepted idea in homoeopathic circles that our medications have a modifying effect on the so-called PNIE axis, i.e. the Psycho Neuro Immune Endocrine axis. The human body has a particular balance of functions indicated by the emotional status, immunological status and endocrine status. That is, should any of these functions be modified by any cause, such as external or environmental stress, as well as internal stress, the changes are manifested as alterations in this axis, which finally percolate down to the somatic level. The vigor of expression at the somatic level would thus depend on the amount of change that has been taken place in the individual, and the capacity of the individual to respond and recover from this state with his internal reserves. This capacity is termed in homoeopathy as the susceptibility of the person. Thus to consider or study the immunological status of an individual from the homoeopathic standpoint, one needs to clearly assess the susceptibility of the person and all the factors that affect or modify it. The second important aspect of cure of immunological diseases is with regard to the choice of the remedy. It is essential that the remedy is a SIMILIMUM or “CONSTITUTIONAL”, i.e. based on both mental and physical generals of the patient. Only this remedy would obtain a continuous, lasting cure and have a modifying effect on the immune system as well as the PNIE axis as a whole Section II studies these aspects. My interest in the topic of immunology is due to the fact that extensive knowledge and details are available to us already; with which, if our homoeopathic principles are applied, it could possibly be ascertained just how our homoeopathic medications bring about a change and cure, as against palliation or suppression. Since today, we are plagued by numerous INCURABLE diseases that are essentially autoimmune in nature, the superiority of our branch of medicine in being able to tackle these diseases at the root is apparent; and to prove this, numerous immunological parameters exist that could be made use of laboratory details. Psychoneuroimmunology is the branch of biomedical science that explores the relationships between the nervous system, emotions, and the immune system. Stress has been suspected of increasing susceptibility to various infectious diseases or cancer for years. Now evidence is mounting that the immune system and the nervous system may be inextricably interconnected. Biological links between the immune system and the central nervous system exist at several levels. One well-known pathway involves the adrenal glands, which, in response to stress messages from the brain, release corticosteroid hormones into the blood. In addition to helping a person respond to emergencies by mobilizing the body’s energy reserves, these “stress hormones” decrease antibodies and reduce lymphocytes in both number and strength. More recently, it has become apparent that hormones and neuropeptides, which convey messages to other cells of the nervous system and organs throughout the body, also “speak” to cells of the immune system. 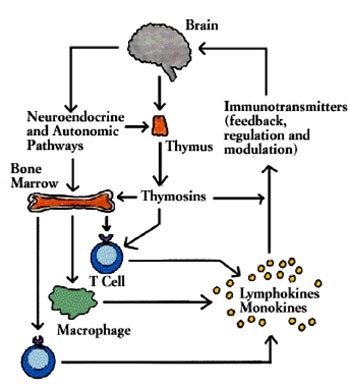 Macrophages and T cells carry receptors for certain neuropeptides; natural killer cells, too, respond to them. Even more surprising, some macrophages and activated lymphocytes actually manufacture typical neuropeptides. At the same time, some lymphokines, secreted by the activated lymphocytes such as interferon and the interleukins, can transmit information to the nervous system. Hormones produced by the thymus, too, act on cells in the brain. The closely interlocked system facilitates a two-way flow of information. Primarily through the language of hormones and secondarily through the immune cells, may function in a sensory capacity, detecting the arrival of foreign invaders and relaying chemical signals to alert the brain. The brain, for its part, may send signals that guide the traffic of cells through the lymphoid organs.